A one-of-a-kind conference and festival for emerging filmmakers and game developers. It's four days of workshops, panels, demos, live play, screenings, tournaments, networking and parties in Atlanta, GA. It began life as CMF Hollywood, Campus MovieFest’s yearly capstone event for over a decade. Bringing together students from over 45 participating college campuses to share their films, network, engage with industry professionals, and party CMF style. Our focus is on emerging creators, which includes early professionals, recent graduates and students, but EVERYONE is welcome. If you love telling stories in creative and compelling ways, or want to take your career to the next level then TERMINUS is for you. If you love watching movies and playing games, then TERMINUS is for you. If you want to have a blast spending four days in an awesome city, with some amazing people, then TERMINUS is for you! Visit the Why Attend page for more info. Is this only for Students? Nope. While we focus on emerging creators, we program with creators at all stages in mind. What access Do I Get with my badge? 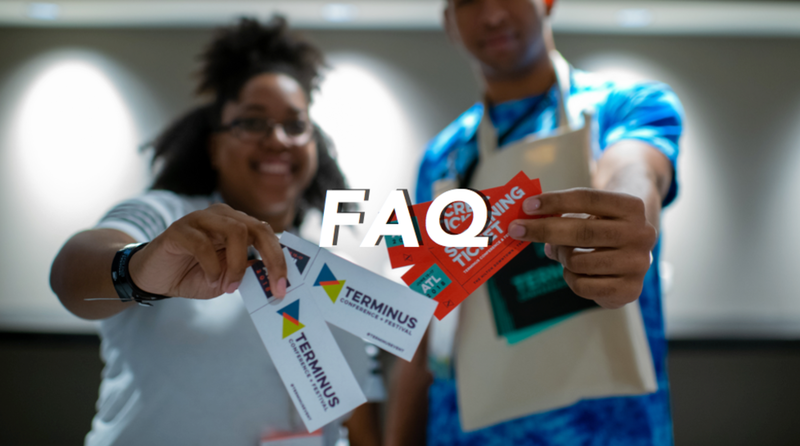 An All-Access Badge will get you in to almost every event at TERMINUS, including workshops, screenings, panels, parties, and more. These events will be first-come, first-serve, day of. A few events may require early registration and/or additional fees. But, they will be clearly listed. AND we’ll give you plenty of time to sign up for those limited-space opportunities. Each badge also includes 2 complimentary screening tickets. Can I buy badges on-site? You could buy your badge then. It’s more expensive than buying early though. So why would you do that? We’ll gladly take your money though. Are you accepting Submissions for Short films and games? Yes we are. They are open to professionals and students. Visit the film and game submission pages for more information, categories, and deadlines. We'd love to showcase your work at TERMINUS in June. Do Short Films have to be about Gaming and Games about Movies? Films and Games can be about any topic and are not restricted to any specific genre, game type or platform. Are accepted films and Games eligible for awards? All accepted films and games are in competition for a Golden Tripod and Golden Joystick award. The jury will narrow the films down to the top nominees, which will be revealed at the awards ceremony. What if I have friends and family who want to attend my screening? All-Access and Student All-Access Badge holders receive 2 complimentary screening tickets. These can be used for any CMF and Festival screening block. Additional tickets will be available for purchase for $10 starting May 16. What if I have friends and family who want to attend only the awards? Awards tickets will be available for $50 starting May 16. Anyone under the age of 12 does not need a badge when accompanied by an adult. While we don’t restrict attendance based on age, our programming focus is on students to early professionals. Depending on their interests, some of the workshops and panels may appeal to younger attendees. However, we cannot guarantee that the content, including language, subject matter, or images, will not be adult in nature. Events, such as the parties, may not be appropriate for anyone under 17 to attend. We strongly suggest parents and guardians review the full schedule before purchasing a badge. If there are questions or concerns, we can be contacted at magic8ball@terminusevent.com. In general? Nah! We want you to be comfortable. June in Atlanta can range from the 80s to the 90s. For the parties we want you to have fun. Dress up! Cosplay! Whatever makes you happy. Atlanta is a foodie paradise, and there are tons of amazing restaurants within walking and Lyft/Uber distance of the Hilton Atlanta nearby catering to all tastes and budgets.